France on Wednesday said it would be in touch with Britain in the coming hours to coordinate a response to a nerve agent attack on a Russian spy, which London has blamed on Russia, after an earlier muted reaction to Britain's allegations. British Prime Minister Theresa May earlier on Wednesday announced that Britain was expelling 23 Russian diplomats because it had received no explanation for the poisoning of Sergei Skripal, a Russian former double agent, and his daughter with a Soviet-made nerve toxin. In contrast to German Chancellor Angela Merkel and U.S. President Donald Trump who assured May they were taking her government's views seriously, President Emmanuel Macron and other French officials have declined to point a finger directly at Russia. French government spokesman Benjamin Griveaux said it was too early for Paris to decide whether action should be taken and a decisions would be made only once a case of Russian involvement was proven. Foreign Minister Jean-Yves Le Drian later expressed full confidence in the investigations being carried out by Britain, though he too was careful not to say directly that Russia was behind the attack. "In the coming hours, France will be in contact at the highest level with the British authorities to coordinate our response," Le Drian said before going into a meeting with his new German counterpart Heiko Maas. The Elysee presidential palace said that Macron would speak on Thursday with May and added that London had been informing Paris and other allies since the start of the week in detail about Russia's responsibility in the "unacceptable" attack. Britain's ambassador to France, Ed Llewellyn, tweeted on Tuesday that the first neuro toxin attack on European soil since 1945 required a "strong and coordinated response from our allies." 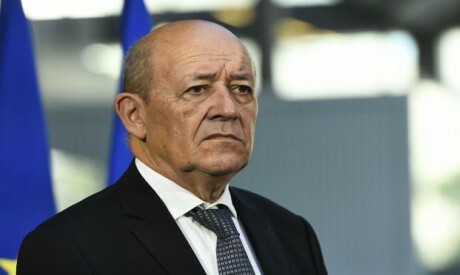 Le Drian said that not only was the security of one of France's main allies at stake, but also that of France and Europe because a lethal nerve agent had been used despite international rules against chemical weapons proliferation. France's nuanced reaction was in line with Macron's efforts since coming into office to build a new relationship with Russia's Vladimir Putin. Rather than directly confronting Putin through threats and megaphone diplomacy, he has emphasised private dialogue, while pushing for a restoration of business and cultural ties despite existing European Union sanctions on Moscow. Diplomats say Macron believes ostracising Moscow will not yield results given its importance on the world stage and role in world crises. Despite obvious differences, he believes it is vital to keep a working relationship going with Russia. Standing alongside Putin last May at the Chateau de Versailles, Macron heralded the start to a new page in relations after tensions under the previous administration. He said at the time that he wouldn't let differences over Syria, Ukraine and human rights strain their relationship. Nearly a year on, there is little evidence to suggest he has gained anything tangible from the alternative approach in terms of foreign policy successes. However, he is due to be the guest of honour at an investor forum in Saint Petersburg at the end of May where a large French business delegation will also be present. "France has a policy on Russia that it’s going to stick to. There’s no reason for this to knock that off-target," a French official said. "You’ve got to remember there are pretty close ties between France and Russia, whether around literature, culture and business, and they are important."